Everything you need to know, to ensure that your submission process is seamless. 1 For Front Cover, please note that your supplied artwork will be flushed to the bottom. Please add 5mm to left, right and bottom sides for bleed ads. Trim and crop marks must be provided. 2 A Full-Page Slot includes Right-Hand Page, Left-Hand Page, Front Cover Interior, Back Cover Interior and Back Cover. Please add 5mm to all 4 sides for bleed ads. Trim and crop marks must be provided. The following formats are accepted for raster files: JPG and TIFF. Please ensure that raster files submitted are at a minimum of 300 DPI in CMYK colour. The following formats are accepted for vector files: AI, EPS and PDF. ​Please ensure that files are converted to CMYK, all fonts are converted to outlines or are embedded, and that all profiles are removed prior to saving to a PDF format. A deposit of 60% of the total sum is to be made upon booking of Advertisement/Sponsorship Slot(s). Upon processing of deposit, a Receipt of Confirmation will be issued. After which, advertisers will be given 5 working days (or till the cancellation date, whichever is sooner) from issuing of the receipt for cancellation. Following this, the deposit will be non-refundable. The remaining 40% is to be paid by the Payment Deadline. If payment is not made, the booking will be considered cancelled and the deposit will be forfeited. The desired artwork is to be submitted by the Submission Deadline. Upon confirmation of full payment, submissions will be processed. Failure to submit materials or make full payment before the respective deadlines will result in the booking being considered cancelled and the deposit will be forfeited. No refunds will be made after the Cancellation Deadline. All rates are in Singapore Dollars. If amendments to the advertisement are required following the Submission Deadline, the client will have to bear the cost for change in layout and casting. Changes will not be made once the final proof have been sent to the printer’s. 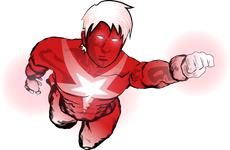 Crimson Star Comics will not be held responsible for any late submissions and delays due to any delays by third-parties. In the event that the publication does not make print, or due to any unforeseen circumstances, resulting in the advertisement not making print, a 100% refund will be made to the client.